Dash is done. The hardest part of this project was selecting the fabric, but that's almost always true for me and my projects. But in this case not only did I need to decide on my fabric, where the fabric was placed in the pattern was also important. I found the the style of this pattern very appealing, but how Heather used different volumes of fabric also added to its great look, so that was something else for me to consider when choosing my fabric. I was rolling right along until I finished the outer three rows in the picture below, and noticed I had three green fabrics touching. It was a pretty easy fix since I was using V and Co fabric, giving me plenty of choices that were not green. But it's funny that I didn't even notice until I had the blocks up on my design wall. The pattern has directions for two different size Dashes, the pattern is the same but the blocks are different sizes. You can make a 78" x 78" or a 39"x 39". I made my blocks in the middle. I also made my large corner block larger and added two extra blocks to each row, for a quilt top that finished at 59" x 59". This pattern is currently in the magazine Simply Moderne, Issue Number 8. I just spied it at Barnes and Noble. It finished at 59" x 59"
The fabric is by V and Co for Moda. Not one family, just an assortment from all of Vanessa's lines. The pattern is Dash by Heather Jones Studio and available here. One more finish then I'l be starting on Due South. Kristen has already started the sew along, she's making Cracked Pots using Kimberbell basics. 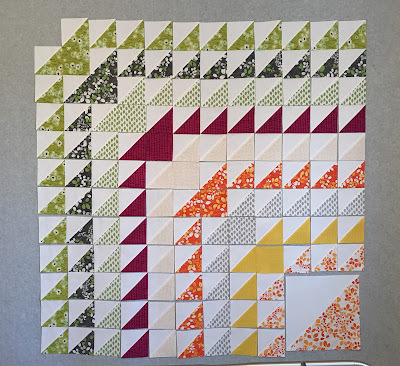 I've linked to Kristen's blog Meadowbrook in my Favorites list so you can follow her progress, or click here. I've not heard from anyone else, I think Kristen is the first to start the sew along and has such a great start may be the first entry in our parade. Be sure to let me know when you start your Miss Rosie's Quilt Co project. I made Due South about two years ago, in shades of gray, white and plum. It turned out beautifully! I gave it to my sister, and she loves it. I used the Rapid Fire lemoyne star ruler for the stars, and my quilter was thrilled with how flat and easy to quilt they were. Hope you enjoy making yours as much as I did. 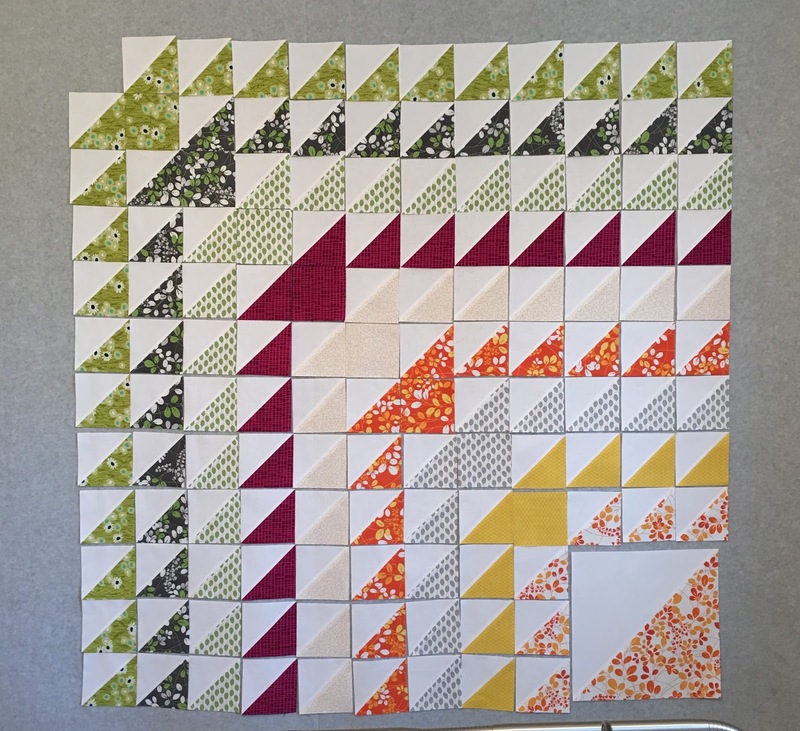 I'm thinking about sewing Due South along with you :-) I have the pattern and I bought a flying geese bloc loc ruler for squaring the blocks. I have a couple of other "irons" in the fire so will have to get to the part about selecting fabrics etc. It's a gorgeous quilt though so would love to make it. Fun quilt! I need to finish some other projects first before sewing along with you but the great thing about your sew-along is that there's no time limit. Congrats on #198, Thelma! I'm planning to join the Miss Rosie Quilt Co. sew along but have too many irons in the fire to start mine now. Good thing we have till the end of the year! Carrie's book is not yet available from Amazon UK - as soon as I receive my copy I am planning to join you!